The apartment, situated on the first floor, is intended for two persons. It consists of a room with a kitchenette, a bathroom and a hall with luggage space. 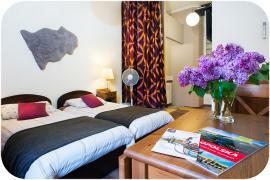 The room has two single beds, two bedside tables and a table with chairs. It also features satellite TV, radio, CD player and free Internet access. If you prefer self-catering, you may use the kitchenette equipped with an electric cooker, microwave, refrigerator and kitchen utensils. The elegant bathroom includes a shower stall, washbasin and hairdryer. The “Old Town I” is one of four apartments available in the building. Together with the “Old Town II” (4 persons), the “Old Town III” (6 persons), and the “Old Town IV” (4 persons), it offers comfortable accommodation for a group of up to sixteen.